I just saw Elysium, the new movie by Neill Blomkamp (District 9). And I loved it. From the first scene, it grabbed me and didn’t let go. I kept thinking, I hope this movie doesn’t disappoint me. Please, please don’t let it turn stupid and disappoint me. In a weird way that I can’t really analyze at the moment because it’s after 2:00 in the morning, this movie made me feel the way I feel about Blade Runner. 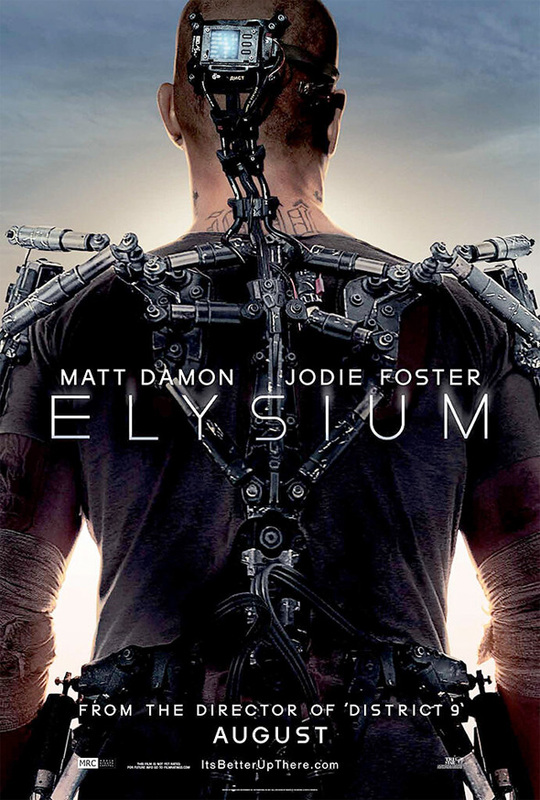 Probably because even though it’s billed as a science fiction action film, Elysium is as cyberpunk as anything, with a gritty near-future dystopian sad-sack world, cybernetic augmentation of the human body, the ability to link the brain to a computer and download information, and hackers rebelling against an oppressive regime. There were a few moments that almost ruined my immersion, a few little plot points that didn’t quite add up, and I can eagerly criticize the evil-for-evil’s-sake thug Kruger who plays the hands-on baddy, complete with extraneous katana a la Serenity‘s Operative and a “I Will Sexually and Physically Threaten Women To Motivate the Hero” trope. Getting tired of that one. Blomkamp could have toned him down a bit… ok, a LOT… and Elysium would approach perfection, for me. But I still loved this movie in spite of its flaws. Because, aside from Matt Damon–whose presence in any movie adds a bonus star to its rating far as I’m concerned–what I enjoyed… no, more than enjoyed… what reached deep inside of me and wrung tears from my jaded soul, is that Elysium is real science effing fiction. The kind that actually includes science, technology, humanity and social commentary. The kind that gives you something real to think about. This movie takes itself seriously. Other than the over-the-top Kruger, who honestly I wouldn’t be surprised if he was only added after feedback from American test audiences or on the insistence of some studio exec… Or, wait… maybe that’s the whole point of his cliché character, to represent the psychotic obsession with sexism and violence we seem to have in the U.S.? Wow. Anyway… There are no aliens. The year is 2154, but the technology is not so far removed from reality that it appears magical or far-fetched. No one “realigns” any “deflector arrays.” A robotic police force, powered exoskeletons, storage of data in living cells, and a large space station could be possible within the next four years, if we really tried, not the next one-hundred and forty years. And we don’t have to wait a century to see a world where people living in slums are willing to risk their lives and break the law in order to give their children medical treatment and a better life. One billion people worldwide live in slums right now and that population is projected to grow to 2 billion by 2030. Yes, there’s a message in this film. But weren’t there messages in Star Trek? A Clockwork Orange? H.G. Wells’ Time Machine? Logan’s Run? V for Vendetta? Stepford Wives? The message at the core of Elysium (and it won’t be a spoiler if you’ve read other reviews and articles) is that human suffering should be mitigated by those with the power to do so. I guess some people have called the movie socialist. But it’s a theme that predates the political term by hundreds of years. Max becomes a savior hero in the vein of Prometheus, Jesus or Robin Hood. Also a little interesting tidbit: Production designer Philip Ivey worked on the Lord of the Rings movie trilogy and several episodes of Xena: Warrior Princess. Maybe I should blame him for arming Kruger with that ridiculous sword?